Redmond, Wash., February 24, 2009 – Bionavitas, Inc. today unveiled its patent-pending Light Immersion Technology™ (LIT™), a scientific breakthrough that dramatically increases algae yields in a cost-efficient and scalable model. Algae, shown to have the potential for solving the reliance on fossil fuels for energy production, are widely recognized as an important source for biodiesel production. 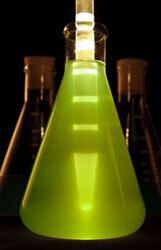 Harnessing the power of the sun or an artificial light source by immersing it in the culture, Light Immersion Technology effectively produces an order of magnitude more algae biomass than existing growth methods, thereby increasing yields and reducing the cost to make algae-based biofuels price competitive with petroleum products. Algae are the ultimate feedstock for biofuel production, promising yields that are hundreds of times greater than those of traditional land-based oil crops such as soy beans or rapeseed (canola oil). The dramatic yields depend upon the efficient use of solar energy not possible using previously existing technologies. Before Bionavitas made its Light Immersion Technology available to the public, nearly every large scale approach to algae growth has been challenged by a simple fact of nature: as algae grow, they become so dense they block the light needed for continued growth. This “self-shading” phenomenon results in a layer that limits the amount of algae per acre that can be grown and harvested. The Light Immersion Technology developed by Bionavitas fundamentally changes this equation by enabling the algae growth layer in open ponds to be up to a meter deep. This represents a 10 to 12 time increase in yield over previous methods that produced only 3-5 centimeters of growth. At the core of Light Immersion Technology is an innovative approach at bringing light to the algae culture in both open ponds and closed bioreactors through a system of light rods which extend deep into the algae culture. By distributing light below the surface “shade” layer and releasing the light in controlled locations, algae cultures can grow denser. In external canal systems, the rods distribute light from the sun into the culture. This abundant and free energy source is ideal for generating large amounts of algae for use as biofuels. In closed bioreactors, the rods evenly distribute more readily absorbed red and blue spectrum light from high efficiency LEDs. While the LEDs increase the cost of production, algae grown in these systems are used for higher value markets such as nutraceuticals. Light Immersion Technology dramatically increases the yield and lowers the cost of algae production, thereby enabling algae’s future as a biofuel feedstock that is renewable, carbon neutral, and can be produced at a comparable cost to current petroleum resources. To address the nutraceutical and pharmaeutical markets, Bionavitas will put its Light Immersion Technology to work in a series of closed bioreactors to create high quality algae that meets the specifications of the health industry. By co-locating with a heavy industrial or power generation operation, Bionavitas will put algae to work in cleaning up toxic and/or contaminated water sources and capturing large carbon dioxide emissions—effectively removing toxins such as high concentrations of heavy metals or excess nutrients as well as reducing greenhouse gas emissions. Bionavitas is a Redmond, Washington-based bioscience company committed to revolutionizing the clean technology industry. Bionavitas harnesses the power of algae for biofuel production, health and nutraceutical products and environmental remediation. The company’s innovative, patent-pending Light Immersion Technology™ addresses the problem of algae “self-shading” by allowing more light to penetrate the algae biomass. This permits the algae to grow deeper and thicker, resulting in the more efficient and expansive algae production necessary for cost effective commercial applications. More information is available at www.bionavitas.com.